Times are changing. Over the past few years based on research we've conducted we have noticed how Senior level Global Business Services/Shared Services leaders have been less than open to the value proposition of the BPO/Business Process Services vendors. Nevertheless, these Senior Executive Leaders are now keen to understand through facts & figures, who is out there leading the digital charge.These leaders are attending SS&O Week Europe in Manchester from 15th - 18th May. As a BPO/Business Process Services vendor, you can no longer approach the market with a pure operational costs saving proposition; you must be able to prove that you can provide your enterprise customers with data and digital prowess. Who has been able to deliver the best RPA gains? Which geographies and processes are being serviced? Which provider has gone beyond mere automation to Intelligent Automation and event Artificial Intelligence? What's more! In our quick fire presentations, each BPO/Business Process Services vendor gets the opportunity to present and unveil their key customer metrics and transformation projects which will illustrate their RPA expertise and Digital Transformation successes. Hard facts and case studies encouraged. Want to contribute to the conversation? 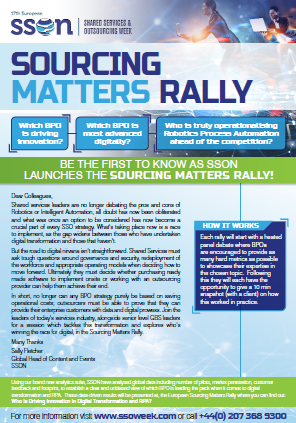 The Sourcing Matters Rally is an invite only forum for SSC and enterprise leaders. Held at SS&O Week Europe, numbers will be restricted to allow for maximum interactivity.